[CIVIL WAR – GETTYSBURG]. 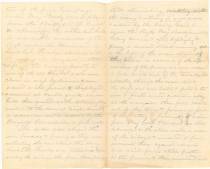 Allen G. Brady, Autograph Manuscript, Gettysburg, Pennsylvania, July 4, 1863. 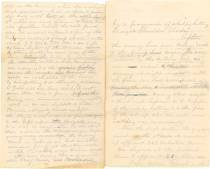 6 pp., in pencil, an unsigned draft or retained copy. With: WHARTON J. GREEN. 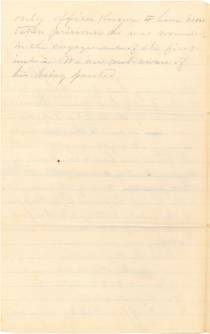 Autograph Letter Signed, to Allen G. Brady, December 13, 1885. Head Quarters 17 Regt Conn Vol. A.A.A.G. 2d Brig. 1st Div. 11 Corps. In compliance with instructions from head quarters I have the honor to make the following report the part taken by the 17 Conn Vol in the engagement of the 1st 2d & 3d inst. The Regt. arrived in Gettysburgh between one & two O’Clock & were marched with the other Regt. of the Brigade to the lower end of the town & halted for a moment. Four companies were immediately ordered out under Maj Brady  two of the four Companys under Maj. Brady were deployed from the bridge to the right as skirmishers the other two held in reserve. The remainder of the Regt under the Command of Lieut Col. Fowler advance with the rest of the Brigade to the front & left of the village. Directly in rear of the 107 Ohio Vol. - who were closed in mass by Division & were ordered to the front Deployed & advanced at Double quick our men held their ground, notwithstanding they rushed to the rear of troops directly in advance until ordered by the Brigade Commander to fall back. This order was obeyed the men loading & firing as they were retreating it was about this time Lieut Col. Fowler was killed. Upon reaching the village the four companys  still skirmishing briskley with the enemy & retiring in good order & ordered by the Comdg Genl to rejoin the Regt. Maj. Brady immediately taking command after deploying & firing in several streets running to the left of the main street of the town on account of the rapid advance of the enemy we were ordered to fall back out of the town & while retreating through the main street the Regt was halted & faced to the rear & poured several destructive vollys into the enemy. We then fell back out of the town & formed in front of the battery pursuant to order from Maj. Genl. [Oliver Otis] Howard we then advanced to the stone wall in rear of the village & remained a few moments there again advanced to a rail fence still further to the front & then remained until  late in the evening when the whole Regt was sent out on picket & performed that duty until late in the afternoon of 2d, when we were relieved & took our old position behind the rail fence w[h]ere we remained exposed to fire of the enemy’s battery & sharp shooters until about 7 o’clock P.M. were ordered to the extreme right of the Brigade behind a stone wall on each side of the lane below the battery opposite the cemetery entrance one company was advanced to the grain field near the woods we covered the wall on each side of the land by compelling 200 straggling soldiers to fall into our line. We had not more than time to form before the enemy were discovered advancing rapidly upon us on our right & a full Brigade obliquely towards our left. The Regt were ordered to fire obliquely to the left upon the Brigade our fire was so destructive it checked their advance the troops on our left giving way the enemy came in behind us but we still remained firmly at the stone wall until the rebels were driven back. It was during this engagement that Maj. Brady was wounded  by a fragment of shell hitting his right shoulder blade. After the enemy had been driven back & the firing ceased except occasional shots from their sharpshooters. We were relieved by the 4 Ohio Vol. and were ordered to change front to the left behind a wall running at right angles with the fence we had occupied and fronting the town where the rebels entered on our left. During that night & the 3d inst. exposed to a cross fire of the rebel batterys & to the fire of the sharp shooters who were watching our movements. The Battle of Gettysburg, fought July 1-3, 1863, was a major turning point in the Civil War. Over the course of three grueling days, Union Major General George G. Meade’s Army of the Potomac beat back desperate attacks by Confederate General Robert E. Lee’s Army of Northern Virginia, including the ill-fated “Pickett’s Charge” on July 3. The Union victory ended Lee’s short-lived invasion of the North. Many soldiers of the 17th Connecticut had been stung by criticisms leveled at their unit after the Battle of Chancellorsville, where the corps was surprised and driven from the field with a flank attack by Stonewall Jackson. As Brady reports here, events on the first day of the Battle of Gettysburg were eerily similar to Chancellorsville. On July 1, their regiment was again divided, outnumbered, and outflanked by the same Confederate unit as it had been at Chancellorsville, although this time under command of Richard Ewell. 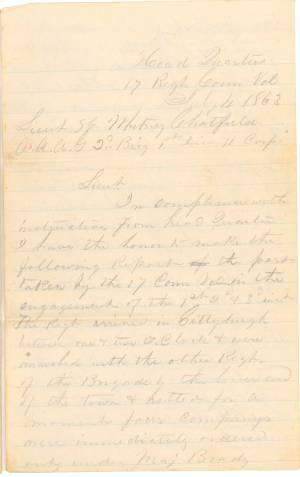 As he drove the Connecticut soldiers from the field and through the streets of Gettysburg on the first day of fighting, Union Lieutenant Colonel Douglas Fowler was killed. In a disciplined retreat that evening, the 17th Connecticut fell back, and was posted near the center of the Union line on Cemetery Hill near a stone wall. Their position, where the Union lines’ “fishhook” curved southeastward toward Culp’s Hill, exposed them to murderous crossfire from Confederate artillery on three sides. The unit sustained high casualties for the next two days; of the unit’s 386 men at Gettysburg, 20 were killed, 81 wounded, and 96 reported missing. Brady himself was wounded by a shell fragment on July 2. Allen G. Brady (1822-1905) was from Torrington, Connecticut. He enlisted in May 1861 as part of the 3rd Connecticut Infantry Regiment. In August 1862, he was commissioned into the 17th Connecticut Volunteers. Brady was brevetted Lieutenant Colonel for his valor at the Battle of Chancellorsville, just two months before Gettysburg. There, Brady assumed command after the colonel and lieutenant colonel of his regiment each fell. Brigadier General Charles Devens commended Brady in his official report, stating, “The Seventeenth Connecticut, under command of Major Brady – its colonel having been wounded and lieutenant-colonel killed – was, in fact, rallied and reformed in their positions.” In October 1863, Brady was discharged for disability, presumably from his wound suffered at Gettysburg three months previous. He was mustered into the Veteran Reserve Corps and served as Provost-General at the Point Lookout Union Prison Camp in 1864. He was brevetted Colonel in August 1865. Series 1, Vol. 25, Part 1, pp. 632-635.